Hello PMB fans! 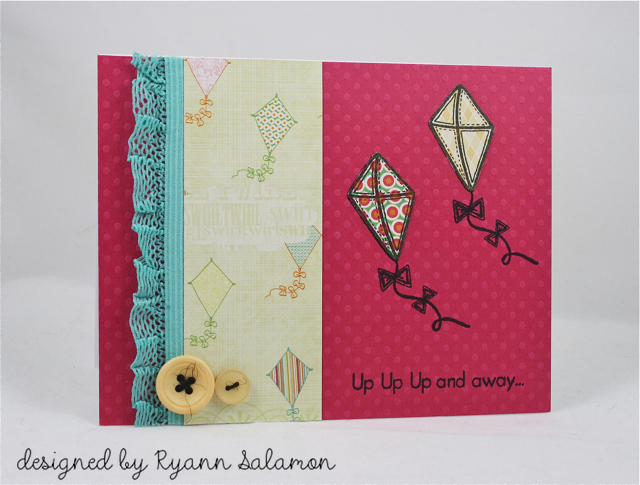 Ryann here to share one last, final card in a month that has been FILLED with tons of awesome inspiration from the Sunday Afternoon kit. Whew! Everything on my card is included in the Sunday Afternoon kit (except the ink) - so many possibilities in each and every fresh baked kit Paper Made Bakery puts together, just for you! Love ! Yep another one I'll have to make with this great kit! Thanks for another cute card ryann! Super cute, Ryann! I love the sketch and the buttons! This is BEAUTIFUL! I loveeeeeeeee the colors and the kites! Love your bold colors and the horizontal orientation makes it so unique. What a totally fun card! just a super sweet card dearie.